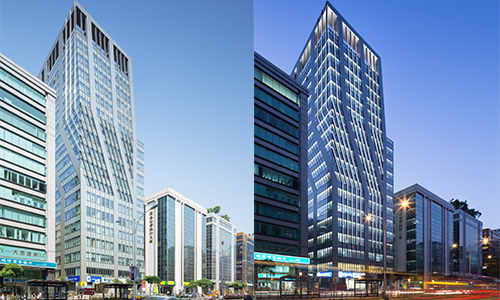 The Fabulous Group HQ | The program of the building is to combine a total of 7 floors in the basement for the use of Metro Rapid Transit system and another 17 floors above for the rentable office. Consequentially, the overall form intends to capture this sensation of flux and movement in a busy urban environment setting. The design of the exterior was to incorporate the idea of flux on the exterior glass curtain wall which would help illustrate visual movements of confluence and rotation with help of vertical fins and LED fixtures attached. The end product intends to capture the concept of flux with series gestures of movements.